Rick was on his way home from a New Year’s Eve party at his family’s home. It was the middle of winter, and the weather was not good. Speeding too fast through a turn, he lost control of his Corvette. It sailed over a stone wall and came to rest upside down in a field. He was thrown from the car, and during the crash, his left arm was severed. Think about that for a minute. It’s like the worst kind of joke – a one-armed drummer. And drumming wasn’t just a hobby or an enjoyable pastime. Rick earned a living by playing drums. Rick went into a downward spin, thinking about all he had lost. His livelihood, his lifestyle, band, even his passion. Until one day, when one of his friends from the band stopped by to see him. Joe sat with Rick and they began to discuss possibilities. Change. Options. With Joe’s help, Rick began to see that there might be a way for him to play drums again, to pick up the pieces and move forward. With help from friends, Rick designed a new drum kit that he could play, using his left foot to play the rhythms that he had played with his left hand before the accident. And the rest, as they say, is history. Two years after the accident, Rick made his first public concert appearance, to thunderous applause. And not long after that, his band released a new album. It sold 20 million copies. With a one-armed drummer! Nothing to joke about there! Rick reached a point of change. The old way of things was no longer an option. The new way would be filled with challenges and setbacks. Rick decided to move forward, to change, to grow. It took guts to make that decision. It took even more courage to follow through on it. Change. As most of us know, change is uncomfortable. We may not resist change itself, but often, we resist being changed. But only in change is growth possible. What are two things you would like to change about your situation? What is one thing you can do right now to begin the change? 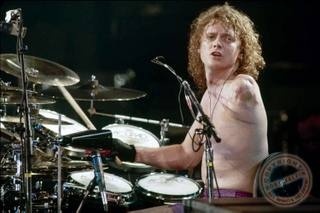 This entry was posted on Tuesday, August 2nd, 2011 at 8:41 pm	and tagged with change, courage, Def Leppard, drummer, drums, inspiration, Inspirational stories, motivation, rick Allen, terry newberry and posted in Uncategorized. You can follow any responses to this entry through the RSS 2.0 feed.